Welcome to Label Bar, the leading UK supplier for Health and Safety, Identification, and Testing and Service Labels. With over 10 years of expert, industry experience, we are well-qualified to provide the widest selection of labels that you need for your company. What can we offer you? We have an enviable choice of labels for you to choose from. 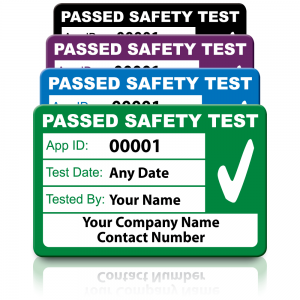 Our PAT Testing Labels come in standard and personalised designs, depending on what you require. 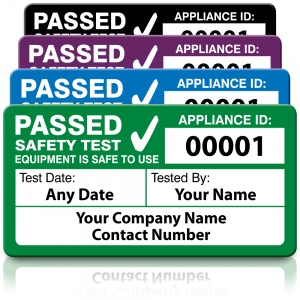 You can look at our comprehensive collection of PAT Testing Labels on our website. Asset Labels are designed to quickly identify important items and also keep your property safe. The Identification Label section includes high quality Asset Labels for you to consider. Do you need Health and Safety Labels for your business? There are many different types that we stock, including compulsory Hazard Warning Signs. All of our Adhesive Labels are designed for easy application. If you require bespoke labels for your business, our Custom Labels are perfect for you. All of the labels that we supply are non-rip and are designed to have high endurance. Why else should you come to us? We are the only UK supplier to offer free delivery on all of our Health and Safety Labels and stickers. Our label range is the most extensive in the UK, with customers from the Scottish Highlands, across to Northern Ireland and down to the Southern Coast of England. Clients buy our labels, because they are convinced that we represent the best overall value. We pride ourselves on our rock bottom prices, fast 24-hour dispatch times and unbeatable customer service. Above all, we excel in our ability to supply you with the best quality labels available. Please contact us on 01325 525 675 if you have any questions or comments.